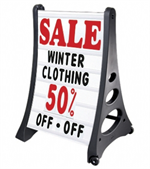 QLA® Message Board Sign Face with sign track on one side to display 7 lines of copy. Includes 2 replacement faces, one for the front and one for the back of the sign. 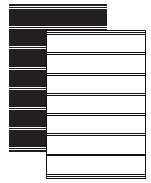 Replacement face for standard size QLA® message board signs. QLA™ Rolling, changeable sidewalk/curb Message Board sign with 2 - 7 line 24" x 36" white sign faces with 314 - 4" characters. 2-sided. Fast assembly. The ultimate a frame sign. This portable sign has wheels use indoor or outdoor. 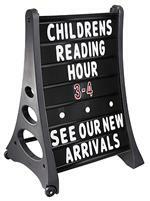 QLA™ Rolling, changeable sidewalk/curb Message Board sign with 2 - 7 line 24" x 36" black sign faces with 314 - 4" characters. 2-sided. Fast assembly. The ultimate a frame sign - built in wheels make the sign very portable. 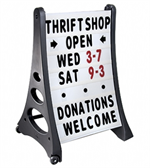 Tip 'n Roll feature allows sign to be moved easily with no lifting or carrying. Great in wet weather! QLA™ Sidewalk signs are made from rustproof techno-polymers with internal steel supports for durability and stability in rainy or windy conditions.